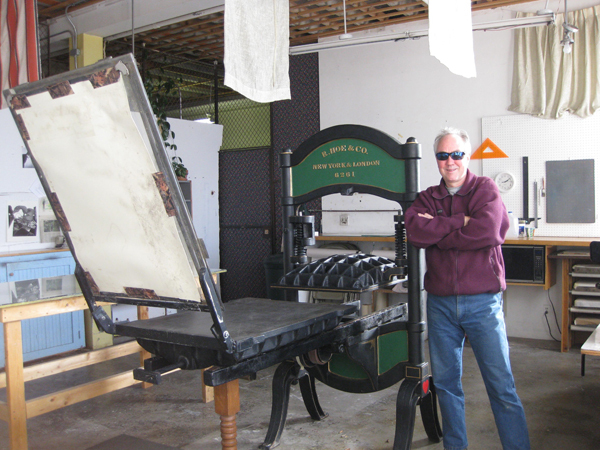 Situated in the roaming, wild hills of Wyoming, lie not one, but two meticulously kept letterpress print shops of the cheerful and ever-ready James Jareb. From his personal Laramie, Wyoming studio to his printing abode at the Truman State Univerity, master craftsmanship and creative know-how flow effortlessly through both. Taking a short break from his print runs, James sat down with us to give us a tour of his gorgeous collection of presses and printed goodies. THE PRESSES Ettan etching press (bed size 18 x 36), Fuchs and Lang litho press (bed size 28 x 40), Three copy presses, Daughaday Card press, Improved 3 x 5, Kelsey Model X (6 x 10), C&P old style (8 x 12), and a R. Hoe hand press, bed size (22 x 30). TYPE OF SHOP The Laramie shop is shared with three artist friends; that space houses the Ettan, the Fuchs and Lang, and the R. Hoe. The other is a small section of the printmaking facility at Truman State University, where I teach courses in all kinds of techniques. THE LOCATION The shop at Truman State is a converted classroom, on the second floor. Sure hope the presses don’t fall through! My real home is in a shop located in Laramie, Wyoming, and is housed in what used to be the town’s high school, c. 1930. Both areas have good natural lighting, and adequate artificial lights. 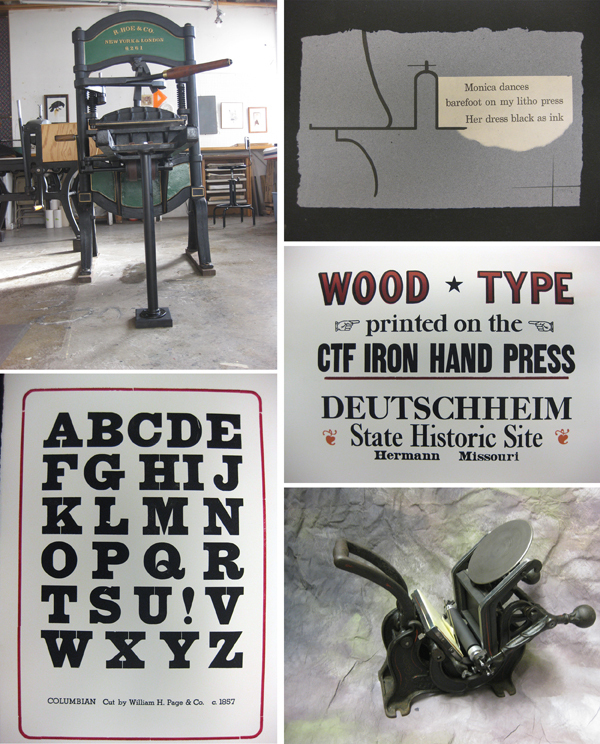 SIZE OF PRINT SHOP 16 x 20 feet (for the letterpress action each at both the Truman State University and Laramie locations). FAVORITE THING ABOUT THE SHOP Probably the C&P. I have had it the longest; she’s my girlfriend. Well, either that press is my favorite piece of equipment, or it is the little paperback dictionary that I keep close by. FAVORITE INK Because I was first trained in traditional printmaking techniques (and continue to make lithos, woodcuts, etc.) my ink knowledge is somewhat narrow in focus, using oil-based relief inks from Daniel Smith and Graphic Chemical Ink Co.
SOLVENT OF CHOICE For clean up of metal and wood type, I use regular mineral spirits and a red rag (we have a contract with the local linen service — they pick up our dirty rags for recycling). For the press and ink slab and photopolymer plates I use vegetable oil […] followed by 409 to degrease. Stubborn ink or grease? Out comes the Everclear! Wow! That stuff will strip anything. PLATE AND BASE OF CHOICE When I print with photopolymer plates, I use the Boxcar Deep Relief plate system, first trying them about three years ago. I am still amazed at the great range of elements that can be brought out of the process: Print print print !!! OIL OF CHOICE I lube the presses with 20w-50 oil, or multipurpose red grease where needed. WHAT TYPE OF RAG DO YOU CLEAN UP YOUR PRESSES WITH Red rag for metal and wood type. Scott brand Blue Shop towels for the press and ink slab. FLOOR PLAN TIPS I have planned and implemented and assisted in the layout of many shops across the U.S. In general, keep spaces tight where you need to do repetitious movement, but also have easy access to some open, clean, “breathing room”. That’s where I hang the motorized mirror ball from the ceiling: you never know when a person might need a spontaneous disco party. PIED TYPE Oh, I did have, a couple years back, a large amount of pied type in the shop, as I was able to get a good deal on the remnants of type from the Columbia Journal in Missouri. Unfortunately, it had been dumped into black plastic trash bags. It took almost a year and a half to sort the usable from the rest. I finally got that accomplished, and still have some really nice, though a bit worn, selections. The rest — all 672 pounds — went to the foundry of Sky Shipley, before he moved to Arizona. ORGANIZATION ADVICE A clean shop is a happy shop. Many years ago I read about Henry Ford and the notion of time and motion studies, which I apply to any shop I am asked to have a hand in designing. PRINTING ADVICE Everything has its place and needs to be put back in its place. Machines, just like the human body, will perform only as well as they are taken care of. Go Print! 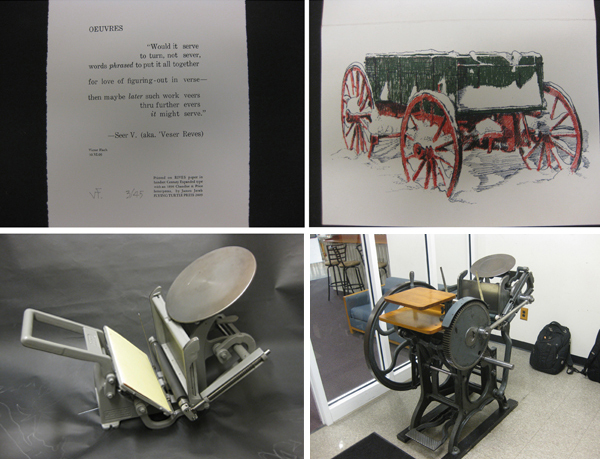 This entry was posted in Shop Talk, Work Spaces and tagged Chandler & Price Old Style, letterpress print shop by Cathy. Bookmark the permalink.